Tidal marshes reduce erosion and flooding impacts while providing high value ecosystem services to coastal areas. A high rate of tidal wetland loss and degradation has been documented in Connecticut, due to human impacts and climate change. To address this issue, a multidisciplinary team of scientists from UConn, including representatives from the Department of Marine Sciences, Department of Communications, UConn Health Center and CIRCA evaluated the feasibility, benefits and costs, design alternatives, and permitting needs for using dredge materials to restore or build fringe wetlands or offshore islands. The project team reviewed available literature, regulations and policy, interviewed neighboring state and federal regulatory agencies and researched the physical and engineering features required to establish wetlands using the most cost-effective dredge materials. 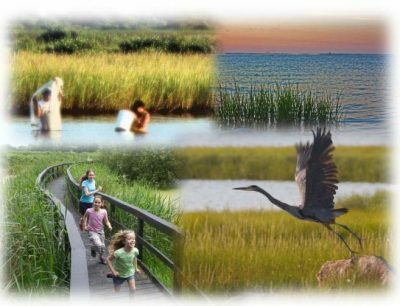 The final project report provides guidance for the assessment, design parameters, regulatory framework, and evaluation criteria for the impacts on vulnerable populations for the state of Connecticut and municipalities considering restoration or creation of wetlands using dredge materials. The project was funded by a Community Development Block Grant Disaster Recovery (CDBG‐DR) after Hurricane Sandy through the Connecticut Department of Housing. This entry was posted in Coastal, living shorelines, Resources, Uncategorized and tagged coastal, living shoreline.